Time theft—when employees accept pay for time they have not actually worked—costs companies $400 billion annually in lost productivity. 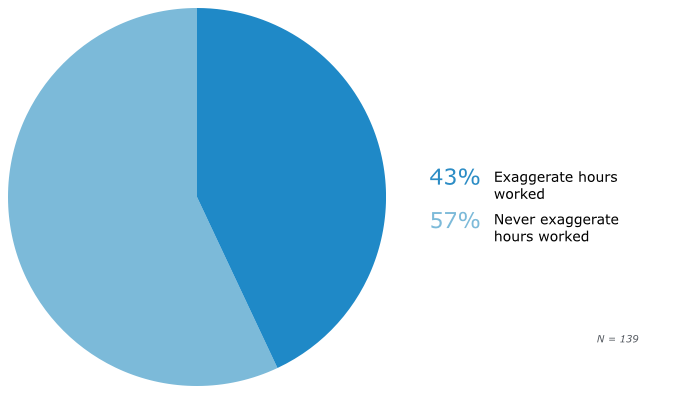 To learn more about how employees “steal” time, we conducted a survey of shift workers. This report will help company decision-makers learn how time and attendance software can help them diminish losses from employee time theft. Forty-three percent of hourly workers surveyed admit to exaggerating the amount of time they work during their shifts. One-quarter of respondents say they report more hours than they actually worked 76 to 100 percent of the time. Time and attendance software that uses biometric clocks appears to be the most effective method for preventing time theft: Only 3 percent of employees report “stealing” time this way. According to studies by the American Payroll Association (APA), almost 75 percent of businesses in the U.S. are affected by what is known as “time theft.” This occurs when employees are paid for time they have not actually worked, either by having someone else clock them in or by inaccurately recording their hours. While clocking in a few minutes early or out a few minutes late might seem innocent enough to employees, the APA reports that time theft can cost companies up to 7 percent of their gross annual payroll. In other words, a business that pays out $1 million in annual payroll could be losing up to $70,000 each year due to “stolen” time. For this report, Software Advice surveyed hourly shift workers to learn how often employees inflate the amount of time they’ve worked, by how much and what method they use to do so. We also explore how time and attendance management tools can help companies limit the amount of time stolen. Of course, employees who commit time theft do not always have malicious intentions. Brian Sutter, director of marketing at Wasp Barcode Technologies (a time and attendance software company) says that for some workers, time theft is as easy as staying a few minutes after a shift is supposed to be over, or arriving 10 to 15 minutes early. In other words, unless there is a mechanism in place through which HR or payroll staff can report time theft to the employees’ direct managers for enforcement, this theft will likely go unreported. 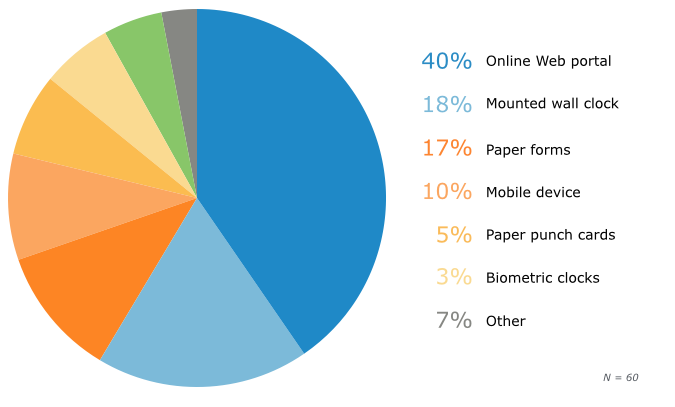 Next, we asked respondents what methods they use to commit time theft. The most common method is by recording inaccurate times (45 percent)—either on paper or digital time sheets, or by clocking in early or out late. Other common methods of “stealing time” include conducting personal activities while on the clock (reported by 43 percent) and taking frequent breaks (42 percent). “Buddy punching”—when a worker has a colleague clock them in or out for a shift when they weren’t actually on the job—is the most overt type of time theft employees use to inflate their shifts. However, this method is used by the smallest portion of our sample: 23 percent. Overall, it seems that for our respondents, time theft is more about a lack of rigor in distinguishing between professional and personal time than it is about blatantly taking advantage of employers. Employees may assume that padding a few minutes here and there is innocent enough, whether they’re spending it stuck in traffic or checking their social media account. However, those few minutes can have real repercussions. For example, a study by research firm Nucleus Research finds that productivity drops 1.5 percent when employees can access Facebook while on the job. The same study finds that 61 percent of employees spend an average of 15 minutes at a time on the site. In other words, over half of these employees are getting paid for an hour and 15 minutes of personal Facebook time each week—which is almost certainly not in their job descriptions. Given that just under half of shift workers inflate their hours, we next sought to determine how often they do so. The good news: The majority of respondents say they record inaccurate times for less than one-quarter of their shifts. The bad news: One-quarter say they exaggerate the hours worked for 76 to 100 percent of their shifts. 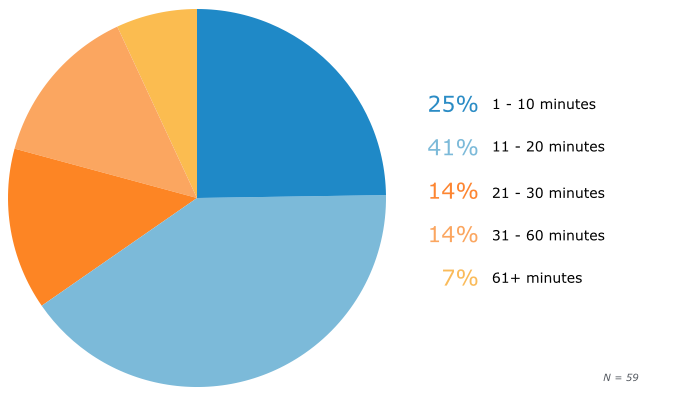 Digging deeper, we asked respondents by how much time they pad their shifts. The highest percentage—41 percent—say they add between 11 and 20 minutes to the hours they actually work. While Sutter believes most employees will only add about 10 extra minutes to a shift, we find that a combined 76 percent of employees who commit time theft steal significantly more than that. Alarmingly, a combined 21 percent steal 30 minutes to an hour or more on a given shift. This adds up to employees getting paid for five hours or more that they didn’t work each week. These findings are in line with studies by the American Payroll Association, which indicate that the average employee “steals” anywhere from 50 minutes to 4.5 hours per week by showing up late, leaving early and taking extended breaks and lunches. At the high end, this equates to around six weeks of stolen time per employee per year—a staggering figure. “You can see how much that would add up for a 50-employee organization,” Sutter notes. However, time and attendance software can help prevent inaccurate clock-punching through “rule-setting.” This functionality, which is common to most time and attendance solutions, allows employers to program employee time clocks to only allow clock-ins or -outs within a specified window. Administrator permissions are required to clock employees in or out if the times are outside the acceptable window for their shift. This can greatly limit the accrual of unworked hours on the payroll. As Sutter explains, a company might have a policy that allows employees to clock in up to 15 minutes early and still get paid for it. When rule-setting functionality is in place, if an employee tries to clock in 20 minutes early, the system will tell them to try again later. As we’ve seen, employees commit time theft quite often—and when they do, every minute counts. So how can companies better prevent paying employees for time they are not actually working? Sutter strongly recommends one solution in particular: “Biometric time clocks, where it requires a fingerprint. You just put your finger on [the keypad,] and it clocks you in.” This, he says, is by far the most effective way to prevent time theft. 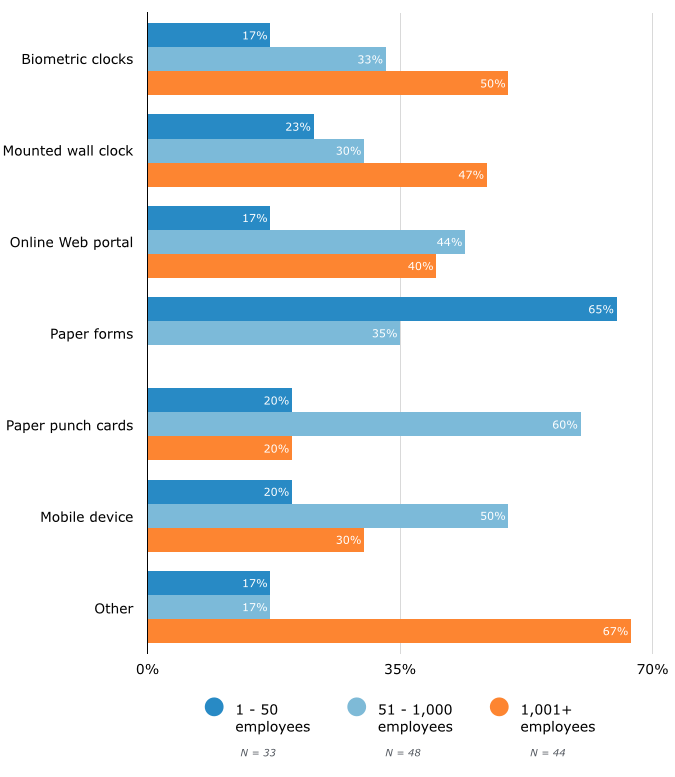 Our data supports this: Only 3 percent of respondents who commit time theft are able to do so using biometric clocks. On the other hand, the method responsible for the worst offenses is online Web portals: 40 percent of employees committing time theft do so using software that requires a login ID and password to access an online time clock. Another digital method susceptible to time-theft is the use of wall-mounted time clocks (used by 18 percent of respondents), where employees use a password, PIN number or badge to clock in and out of a physical device. Paper forms, where employees record their shifts on a form or spreadsheet, is also high on the list. Given that this method relies on the honor system, it is not surprising that employees pad their hours. Studies have shown that self-reported data is often inaccurate, as the subject tends to report only what will reflect positively on them. As Sutter points out, even if a company uses an online Web portal, employees can easily share their credentials and have another employee clock them in. Technically skilled employees might even be able to hack online time clocks. But when it comes to biometric time clocks, which use an employee’s fingerprint to verify their identity before clocking them in, it appears to be significantly more difficult to cheat the system. Indeed, a report by American Payroll Systems (APS) claims that biometric-based time and attendance software can eliminate the most blatant form of time theft: buddy punching. Of course, as 3 percent of our sample reflects, there will always be a workaround for the truly determined. For example, at one Brazilian hospital that instituted biometric clocks, doctors created fake silicon fingers bearing their fingerprints, which their co-workers used to clock them in and out of shifts. However, employers can rest assured that the vast majority of employees would not go to such great lengths just for a few extra minutes of pay. Digging deeper, when we break down each time-tracking method by business size, we find that only 17 percent of biometric-clock users are small businesses (with 50 or fewer employees). Meanwhile, small businesses account for 65 percent of those using paper forms. This is almost certainly due to the higher price tag that biometric solutions come with, as a result of their more advanced capabilities and the hardware they require (i.e., fingerprint scanners). However, while many small businesses may shy away from using time and attendance software—especially biometric clocks—because of cost, the return on investment can often be recaptured quickly. Going back to the APA’s previous example of a company with $1 million in annual payroll expenses losing $70,000 per year to employee time theft, even if a new system cost a few thousand dollars, this would be more than recouped over the course of the year. “Generally, a system like this would pay for itself in one to two months,” Sutter says. Another benefit is that these systems are easy to set up. All a company needs to do is purchase the software—which will include a biometric time clock—from the vendor. Then, as Sutter explains, all the company must do is have an electrician set up the clock at its main point of entry. Time theft is a clear and widespread problem for businesses. Close to half of the employees in our survey admit to collecting pay for time they did not work—and one-quarter of those employees admit to doing so for 75 to 100 percent of their shifts. Luckily, time and attendance software offers several ways to mitigate this problem. For example, by using standard rule-setting functionality, managers can actually prevent employees from clocking in early. A mounted wall clock, tied to a time and attendance system, can provide additional security, as these systems are more difficult to cheat. Finally, biometric time clocks that require employee fingerprints to clock in and out for shifts offer the most secure line of defense. These systems are more expensive than traditional time and attendance software, but are nearly impossible to cheat through many methods of employee time theft, such as buddy punching. Regardless of what type of time and attendance solution companies decide to invest in, even cutting down on a few minutes of “stolen” time for each employee can save thousands of dollars each year. To collect the data in this report, we conducted a seven-day online survey of 11 questions, and gathered 139 responses from a random sample of employees within North America. We screened our sample to only include respondents who performed shift-based work and self-reported their hours to their employers. Software Advice performed and funded this research independently. 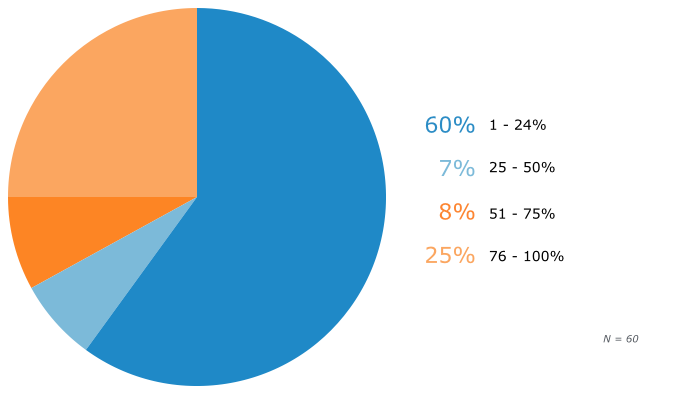 Results are representative of our survey sample, not necessarily the population as a whole. Sources attributed and products referenced in this article may or may not represent client vendors of Software Advice, but vendor status is never used as a basis for selection. Expert commentary solely represents the views of the individual. Chart values are rounded to the nearest whole number. If you have comments or would like to obtain access to any of the charts above, please contact erin@softwareadvice.com.